Buffalo Police are reporting a water main break in North Buffalo early Saturday afternoon. BUFFALO, NY - Buffalo Police are reporting a water main break in North Buffalo early Saturday afternoon. Police say a 36" main water break happened at Hinman Avenue and Military Road just after 10 a.m. Saturday and the break did cause some street flooding in the area. Water was restored a short time after the incident occurred. Crews on the scene say clean up is nearly completed and repairs to the water main will continue. 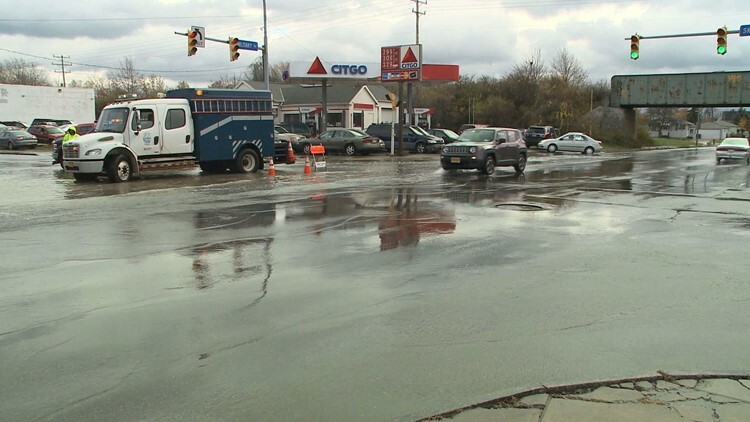 Police tweeted at 12:45 p.m. that the Buffalo Water Department was on scene near the break at Hinman Avenue and Military Road in North Buffalo. Traffic Alert: Buffalo water on scene of a water main break at Hinman Avenue & Military. Traffic is being affected in the area. Motorists should avoid that intersection.